The Salvation Army’s SAFE School of Arts is celebrating 40 years of supporting people with special needs. This week (until 1 August) more than 80 delegates and assistants from across the United Kingdom will attend the Christian summer school at the National Star College in Cheltenham. The week offers workshops in music, drama, dance, craft and sport and ends with a final festival of worship for friends and family, showcasing what the school has achieved together throughout the week. Mandy Lanceley, 44, went to watch the final festival back in 2003. “I have scoliosis, curvature of the spine, quite severe, double curve. And I had body braces from the age of two, plaster casts, I was strapped into traction for four years and then I had major surgery when I was 14. The SAFE School of Arts is the result of an association set up by The Salvation Army in 1968 to provide compassionate support, a listening ear and practical help for people with special needs and the careers and families that support them. The first Christian summer school was held in 1975 at a hotel in South Wales. It became quickly popular and continues to be oversubscribed. It was during the SAFE final festival in 2003 that Mandy met future husband Tristan, a delegate with a learning disability. “He just kept smiling at me and I thought ‘ooo.’ We got married on 16 September 2006. “SAFE has changed my life. Tristan had said that he’d given up hope of finding anyone and I’d given up hope too. 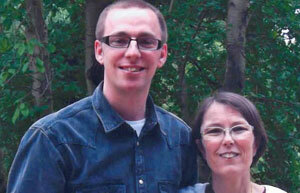 Mandy and Tristan are active members of Bromley Temple Salvation Army church on Ethelbert Road. “Tristan is an absolutely amazing keyboard player. He’s our church pianist. He plays for the congregational singing, for soloists and for the choir. Because of his learning disability he can’t read or write music but he can pick up the piece after hearing it once or twice, and he’ll play it back note for note. This year also marks the 150th anniversary of The Salvation Army itself, an international Christian church and registered charity active in 126 countries. The Salvation Army’s programmes to support people with special needs demonstrate its commitment to meeting the needs of society and making the Christian message accessible to all. Today in the UK and Republic of Ireland The Salvation Army’s work includes more than 800 community churches and social centres providing a diverse network of services for people experiencing homelessness, poverty, or unemployment, adult victims of modern slavery, older people, children and families.